7.7 What About Cardio and Abs? 8 Sound like a lot to absorb? It isn’t enough to just walk into a gym and throw around some weights, not if you want to be successful in short order. You must instead have a weight training program built to achieve your specific goal – to build muscle mass. This page works through the components that go into programs that demand muscle growth. Make each of these components strong within your program and you will get the muscle building results you are after. Weight training is important. But it isn’t everything. Diet and rest also factor into the muscle building equation. Along with training, these three main factors will determine your success. Fail to account for one factor and you will fail to maximize your muscle building capability. The most common mistake beginner and intermediate mass gain trainers make is an over-emphasis on their weight training and an under-emphasis on their eating and rest. Diet to supply the body with the raw materials it needs to build muscle. Provide the body enough rest time with which to repair and rebuild muscle. You will not need to venture far in the bodybuilding world before coming across someone willing to cage-fight to defend his training philosophy. The way he trains is the end-all. It is the hands down best way to work out all the time, with no exceptions. When you meet the guy who can’t see beyond his own training philosophy, save yourself the grief… Smile politely. Walk away hurriedly. HIT – HIT, an acronym for High Intensity Training, calls for 1-3 workouts a week with full body single-set routines. These are short but intense workouts. The basic prescription is 8-12 reps per set always done to failure. The goal is to show an increase in strength in each and every workout. So, with each successive workout, you should either look to perform more reps with the same weight or the same number of reps with a greater weight. Periodization – Weight training programs based on this philosophy approach progressive overload in a different way. In a periodization program you may do light training for three weeks, followed by medium training for a few weeks and then do heavy training for the final cycle. Emphasis is not placed on achieving gains in every workout but rather on the cumulative gains after all phases. The basic idea is to change intensity and volume levels to prevent overtraining. The basic difference is that HIT recommends always doing high intensity workouts while periodization advocates cycling your intensity. Compound exercises are multiple-joint movements that use multiple muscle groups. The bench press for the upper body and the squat for the lower body are two of the most important. Isolated exercises are single-joint movements that target a single muscle group. Examples include biceps curls and dumbbell flyes. Weight training programs designed to build muscle fast focus on compound exercises. Compounds allow you to stimulate the most muscle fibers in the least amount of time. In other words, they give you the most bang for the buck. Isolated exercises can also be an important part of a program. They can be used to hit muscle groups not adequately covered by compound exercises. Or to give extra attention to a lagging body part. You don’t need an advanced degree in exercise science to figure out the above exercises. They aren’t fancy or complicated, none are helped with half-drunk, late-night infomercial purchases. Muscle mass is built with the basics. It isn’t built wasting time trying to hit every single muscle from every single angle. It isn’t built with secret exercises heavily-guarded by IFBB members. If some crazy scenario forced you onto a deserted island where you could take only 8 exercises… Taking the “8 Get Big Exercises” wouldn’t make you look dumb. The numbers in the above table are general ranges. They are based on going to fatigue or failure. For an 8 rep set, for example, the weight used would result in the physical inability to perform another rep or two due to muscle exhaustion. For bodybuilding goals (muscle size), weight training programs should concentrate on medium sets. This is where maximum hypertrophy (muscle growth) will occur. While the emphasis for muscle building should be in the 7-12 rep range, it isn’t necessarily wise to use these rep ranges exclusively. Working heavy and light set routines into your programs can help keep your muscles responsive and growing. This “change-of-pace” can help make follow-up medium set routines more effective (a periodization technique). It can also help you break past stubborn plateaus. Another factor to keep in mind is that different muscle groups respond differently to different rep ranges. For example, the calves and abdominals often respond best to higher repetitions. Sean Nalewanyj keeps his training clients on a heavy to medium load sets on most exercises. The “sweet spot” he recommends to get the greatest strength and muscle gains is 5-7 reps.
To follow this, use a load that brings you 1-2 reps short of failure between 5-7 completed reps. In Body Transformation Blueprint, Naleywanyj notes lower rep ranges may also present a psychological benefit. High-rep sets can take some time. They can require some psyching up, some effort to maintain focus. Low-rep sets just need the focus to put forth a short burst of intense effort. This can help keep your workout moving. Progressive overload is a simple concept. It means that with each successive workout you increase the demands placed on the muscles. You have to convince the body that it NEEDS to build muscle. To do this, you have to continuously push yourself. Doing 25 push-ups a day for a year is NOT encouraging the body to build muscle. It is instead encouraging the body to condition the muscle it already has in place. Weight training programs designed to build muscle mass MUST be based on progressive overload. They must be focused on lifting greater and greater poundages. To learn more about progressive overload, hitting the right muscle fiber types and forcing your muscles to grow, check the Building Muscles article. What a lot of beginner and even more advanced trainers have trouble grasping is the important role rest plays in building mass. You will hear the above saying tossed about a lot in weight training circles. Learn what that means and PAY ATTENTION to what it is telling you. When you lift weights you are not actually building muscle, you are breaking muscle down. You are, when working out, essentially planning to build muscle. You are delivering the blueprints to the builder. But the build isn’t going to get done unless and until you’ve given the builder the appropriate time to complete the project. If you want to build muscle, give the body the opportunity to do the building that your weight training programs encourage. Your body builds muscle while you are resting – while you are sleeping and while you are on the couch watching DVDs. It is only when the body is not busy with keeping you functioning in some way that it will find the time to work on rebuilding the muscle tissue your training broke down. Give the body insufficient rest time and you will get less than optimal results. How much rest? This will vary by the individual. Below are some guidelines that all but the most genetically gifted or chemically enhanced would be wise to adhere to…. Muscle groups should be worked a MAXIMUM of twice a week if using splits and three times if using full-body routines. The more you work your muscles, the more you should look out for overtraining. Each workout should last a MAXIMUM of one hour, 50 minutes being preferable. There should be a MAXIMUM of 5 workouts per week. After a MAXIMUM of 8-12 weeks of continuous training, take a 1-2 week vacation from weight lifting. The above are not optimal suggestions, just maximums that most trainers will be best served not to exceed. The trainer that works five days a week will not necessarily gain more muscle than the one who trains two. If you are spending a maximum of 5 hours a week in the gym, what do you do for the other 163 hours of the week? You concentrate on eating and getting your rest. 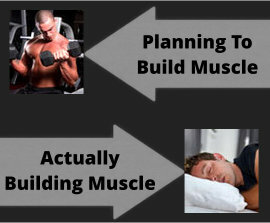 Again, quality dieting and quality rest will prove as important to your mass building goals as your training. For more on the value of rest and sleep, check the long-titled article, Adequate Rest To Avoid OTS & Maximize Muscle Gain. With an appreciation of what makes for good muscle building, the next step is finding a weight training routine. There are many bodybuilding routines available to you, on the web and in books. You can use them as they are, modify them to your capabilities and needs or design your own from scratch. Check out my Sample Bodybuilding Routines. You are NOT trying to find a routine that will last you a lifetime. You are looking for multiple routines that will work off of each other within your weight training program. With time and the information gathered from your tracking program, you will learn which routines prove most effective for you. Don’t place undue emphasis on the routines. Use the above bodybuilding tips as a tool to evaluate your weight training programs. It can help identify the areas where your program may be weak and limiting your gains. Maximum intensity is giving everything you have. It is complete focus, complete confidence. It is putting every ounce of effort into each lift and putting a weight down only when you have nothing left to give. Intensity is holding nothing back, saving nothing for later. It is always pushing for more. To build muscle you must workout with intensity. Your goal is to convince your body that it NEEDS to add muscle mass. You can kid yourself but you can’t fool your body. Your body knows exactly what you have left in the tank. If you leave a set with more to give, your body isn’t going to see a need to build more muscle for you to waste. Intensity isn’t about how loud you grunt. The only quantifiable measurement of it comes in the results you get. Intensity (or lack of intensity) is the reason that the gym’s socialites look the same month after month, year after year. And it is the reason that skinny guy who couldn’t cast a shadow six months ago blew up so quickly. You should never take intensity for granted. No trainer ever masters intensity, there is always room for improvement. When your progress slows, take a look at increasing the intensity of your weight training programs. For some tips, check the Mental Bodybuilding Techniques article. The above page goes through many methods, everything from single-set routines to more advanced weight training methods. All these methods can be effective in putting more weight and muscle on your body. The most important thing to remember is to not fall in love with one weight training routine. If you’re looking for love, fall in love with the squat. But just date weight training routines for four to eight weeks (or until your progress slows). After a while, you can go back to your favorite. If you fail to keep the body from acclimating by switching methods from time-to-time, you will fail to maximize your gains. Split routines, as the name suggests, split the body’s muscles into different groups. You then work each group on a different day. Splits allow for more exercises to be performed for each muscle group. Used correctly, the targeted muscle groups can be stressed greater. Theoretically, this can lead to more muscle growth. Splits may be “all the rage” but don’t forget about full-body routines. They can be as effective or more effective. Tempo is the speed at which you perform your lifts. To build muscle, it is important to concentrate on the eccentric (lowering) part of your exercises. It is during the controlled lowering of the weights that the most small tears in the muscle fibers are created. Tearing muscle fibers is a good thing, its what you are trying to do. Given adequate time and nutrition, the body will rebuild these tears. It won’t just rebuild them as good as they were before, it will rebuild them stronger. This is the body’s natural response, its survival mechanism. It rebuilds itself stronger to protect itself from the newfound stresses you are placing on it. This is why weight training builds muscle. The more tears, the more rebuilding, the more muscle. Whether you call it cycling, periodization or just different stuff, your weight training should change every four to eight weeks. Or, as needed. Your body will acclimate itself to the stress you put on it and, once acclimated, progress will slow or stop completely. This can be one of the most frustrating parts of training. Just when you get growing, you can stop growing. Your muscles react best to unusual stress and it is up to you to keep subjecting them to new challenges. Don’t neglect warming up and stretching. Not if you want to maximize your bodybuilding workouts. What does warming-up and stretching do for you? Gets the blood flowing, the body temperature up = allows the body to perform better. Five minutes of a light aerobic exercise. This can be stationary bike riding, jumping rope or jogging in place. Anything to just raise the body temperature a bit (you don’t want to make this a workout all to itself). Stretch. Do your stretching after warming up – the muscles will stretch better when warm. During your workout, do warm-up sets before hitting your muscles with the heavy weights on your work sets. Warming up and stretching will help you reduce the risk of injury and lift heavier. This increased performance will allow you to build more muscle. You’ll be glad you took the time. What About Cardio and Abs? Moderate cardio can help your muscle building goals. “Moderate” means a couple of sessions a week. Once you get past that, cardio can come into conflict with your goals. Excessive cardio can eat up the calories you need to build muscle. Weight training programs are most effective with defined and narrow goals. For more on this, check out The Weight Gain Plan (Pt. 2). Gaining mass isn’t a lifetime project (or, at least, it won’t be if done right). Putting cardio training on the back-burner as much as possible is a good plan in the short term. As you gain mass and close in on your goals (or your genetic potential), you will change your focus to cutting and maintenance training. For this training, cardio work will play a major role. Abs conflict with weight training programs designed to gain mass in a different way. Ab training should not be ignored or limited like cardio work while trying to gain mass. Instead, abs should be hit hard. Abs are an important muscle group and strong abs will aid in your quest to build a bigger body. But don’t expects to see the eye-pleasing results (the legendary six-pack) for all your hard work. Not while your on a weight training program designed to gain mass. In a mass program your goal is to build muscle and your diet is designed to provide the increased nutrition which will allow you to do this. It is not designed to get your body fat levels down to the levels where your abs will ripple (see Eating to Gain Weight: Concerns About Body Fat). Again (and again and again), do not try to multi-task your physique-changing goals. Bodybuilding will not lend itself well to this method. Do one thing at a time and you will get where you want to go much faster. Sound like a lot to absorb? The basics of weight training programs to build mass are second nature to experienced trainers. For beginners and intermediates, however, understanding and intelligently applying all there is can be a daunting task. There are an infinite number of ways to stray off course and end up limiting your gains. That’s why I recommend that the beginner as well as the more experienced but frustrated trainer seek some guidance. The guidance can come from a qualified personal trainer or through one of the top online muscle building programs. Doing things the right way doesn’t take any more time than doing them the wrong way, but it will produce better results.